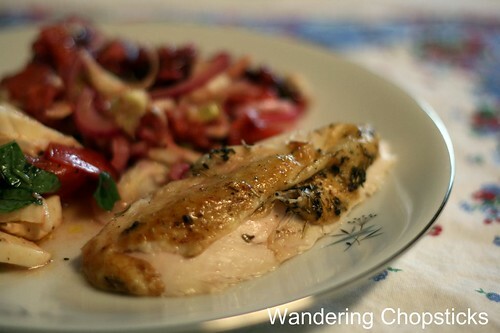 I've made my Basic Salt Pepper Lemon Baked Chicken so many times that I can't believe I haven't blogged before the variation of adding Italian herbs such as basil, rosemary, and thyme. I've made baked chicken often enough that it's beginning to be, well, not that special anymore. But on this evening, my darling niece was joining me for dinner, well, and my brother too. And you know I only make my roast chicken for those I love. 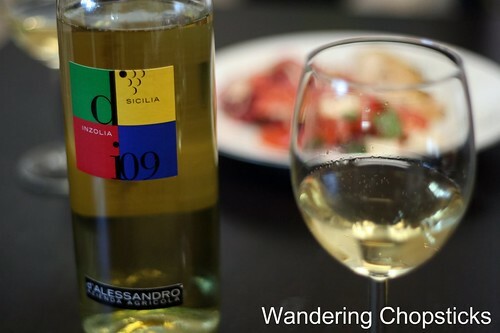 While I was prepping the salads I was serving with dinner, a freebie bottle of wine from d'Alessandro Winery was delivered. A nice bottle of wine to go with my roast chicken? Could the timing be any better? Optional: Cube potatoes or other root vegetables and place them around the chicken to roast and absorb excess juices. 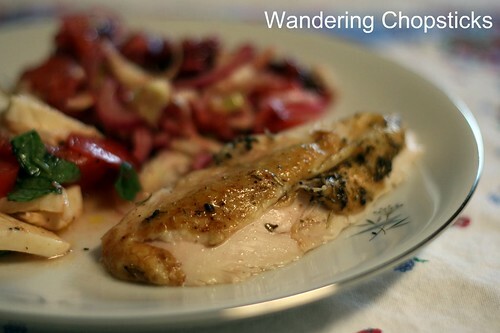 Wash chicken and allow juices to drain. Rub salt all over inside and outside of bird. Let chicken sit at room temperature for about an hour to soak in the salt. You may cover the chicken with plastic wrap if you wish, but it's not necessary. After one hour, drain off any excess juices and squeeze about 1/2 lemon for each pound of chicken. For a 3-pound bird, two lemons should be enough. Pour lemon juice all over outside and inside of chicken. Then grind fresh black pepper over surface of chicken. Sprinkle about 1/2 tsp each basil, rosemary, and thyme. With a fork, deeply prick holes all over a lemon so that juices can drain out while cooking. Stuff lemon inside the cavity of the chicken. If you like tartness, you can also cut the pricked lemons in half so more of the juices drain out during cooking. Cook chicken breast side down at 425 degrees for half an hour. Turn over so breast side is up, adjust temperature down to 325 degrees and cook for another hour until skin is crisp and golden. 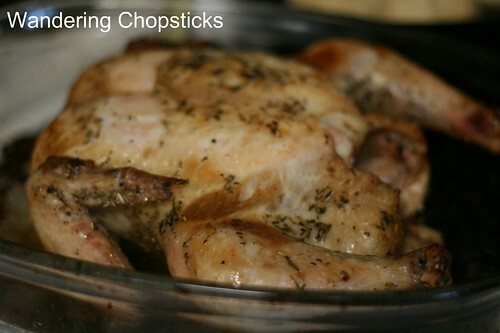 After the chicken is done, allow it to rest at room temperature for at least 15 minutes. Otherwise, the juices will all run out. 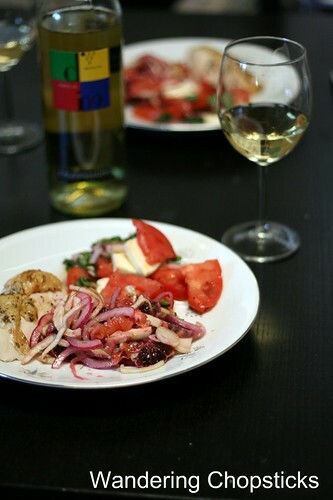 I served the chicken with an Italian Caprese Salad and a Fennel, Blood Orange, and Pickled Onion Salad. As for the wine? It was a d'Alessandro Azienda Agricola Inzolia. I've never heard of inzolia grapes before, but a quick Google check tells me that they are native to Sicily, which makes sense since the vineyard is committed to using local resources. These white wine grapes were grown in the Agrigento region of Sicily, harvested by hand in September, and aged four months in stainless steel tanks followed by two months in the bottle. It's ideally paired with seafood, but I think it went just fine with my roast chicken. Hmm. You know I have no nuance for detecting such subtleties. All I can tell you is that the crisp, light wine went well with roast chicken and perfectly complemented the blood oranges in my salad. Thanks Dana of Colangelo & Partners Public Relations for sending me the wine to try! As for the dear niece, even though her legs weren't long enough yet to reach the pedals on the $5 thrift store tricycle I bought her, she loved being pushed around anyway. I love the little basket in front that has room for a doll or two. 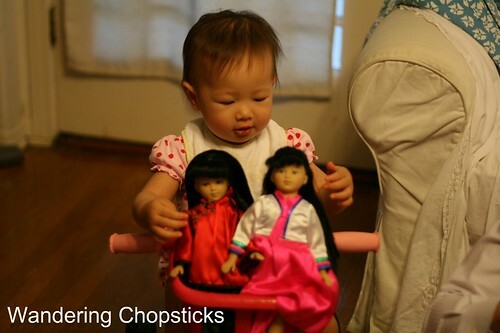 The Chinese and Korean dolls were also thrift store hauls, $7 each, new-in-box. My brother said she's too young to know how to play with dolls, but I beg to differ! She knows. But let's just keep the dolls at auntie's house for when she comes over to visit, yes? 1 year ago today, French Stuffed Cabbage Rolls with Beef, Fennel, and Rice. 2 years ago today, Pho Ga Huong Que Cafe - Oakland. 3 years ago today, Bo "Ne" Bit Tet (Vietnamese "Stand Back" Beef Steak). 4 years ago today, Fried Rice with Hot Dogs, Eggs, and Ketchup.